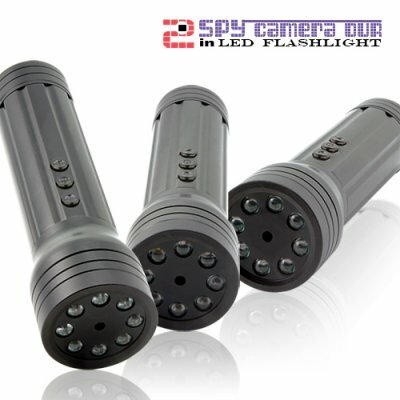 Successfully Added LED Flashlight DVR - Metal Sport and Bicycle Camera to your Shopping Cart. This compact DVR in LED Flashlight, often called a "Flashlight Cam" in the press, is a pocket-sized, must-have gadget. Use it as a regular LED flashlight, or better yet, put it on your bike for color video recording (with audio) and instant picture snapshots for day or night . With the simple press of a button, you can record crystal clear 640 x 480 resolution color video (with audio) at 30FPS or take instant picture snapshots. Everything is recorded onto a 2GB micro SD card (provided free! ), which can be easily viewed on your computer by using the the mini-USB connection. This amazing DVR in LED Flashlight has many uses (ranging from video evidence for the police to keeping a video diary for those exploring dark places) and is especially great as a gift or for reselling online. Available in our warehouse right now, order today and we'll ship it out tomorrow. Brought to you by Chinavasion, the leader in Wholesale Electronics and DVR Gadgets. Do not attempt to unscrew or disconnect the head (area with LED lights) of the flashlight - doing so will void the warranty! Why is there no response when I press the picture snapspot/video record button? After each operation, the device will return to standby mode, which causes a very slight 1-2 second delay. Why can't my computer read this device? For file transfers, it only works on the operating systems listed in the Manufacturer Specifications. For all other operating systems, you will need a micro SD card reader. The video and the image quality was very good. The only setback is the camera stand. The camera shakes if mount inside the car. Other wise its really a great spy cam. The video image is very good, the picture image is even better. The sound recording is very clear and sensitive, will easily pick up a voice across a room. It's easy to operate and solidly built. Shipping was super fast, China to Southern California in 3 days! i got this flashlight recently for a normal in the car flashlight. Its fun when you see something stupid on the side of the road ( in LA there is a LOT of it). The rechargeable battery is very nice just as a flashlight itself. I use the camera more than i thought i would. I use the storage device for more than just pictures as a hidden 2 gig thumb drive, as well as a mini flash hub. Its pretty cool all in all. 3 days from china isn't too bad. very fast. I got the 1200 lumen flashlight with this..... WOW, everyone should buy it.